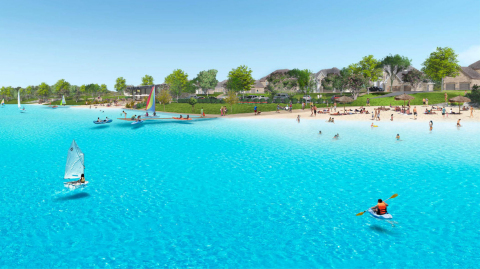 PROSPER, Texas--(BUSINESS WIRE)--Terra Verde Group, developers of the award-winning residential community Windsong Ranch in Prosper, TX, today announced plans for the construction of a five-acre crystal clear lagoon by Crystal Lagoons, which will create a beach-style lifestyle in the award-winning residential community. The man-made, environmentally friendly freshwater lagoon with white sand beaches is the first of its kind in a primary residential community in North Dallas. Windsong Ranch is an award-winning, 2,030-acre residential development by Terra Verde Group, located at 1001 Windsong Parkway South, just 2.5 miles west of the Dallas North Tollway on the north side of Highway 380 in Prosper, TX. Upon completion, Windsong Ranch will consist of 3,100 single-family homes and 150 acres of mixed-use development along U.S Highway 380. Homes within the community are priced from upper $200s to $1,000,000+ and range from villas to single-family homes on 61’- 86’ lots. Windsong Ranch is 35 minutes from downtown Dallas, 30 minutes from DFW Airport and 40 minutes from Dallas Love Field. Major shopping conveniences are just outside the community’s entrance. More information on Windsong Ranch is available at www.windsongranchliving.com. Crystal Lagoons is a multi-national water-innovation company with US headquarters in Miami, which has developed an innovative concept and technology, patented in 190 countries, enabling the low-cost construction and maintenance of unlimited size bodies of water in crystal clear conditions. Crystal Lagoons' impressive turquoise waters are revolutionizing the real estate world as well as water and energy production. Applications range from bringing idyllic beach life to locations otherwise thought unimaginable, to providing industrial solutions for closed-circuit cooling systems for thermal power plants and data-centers, among others. More information is available at www.crystal-lagoons.com. 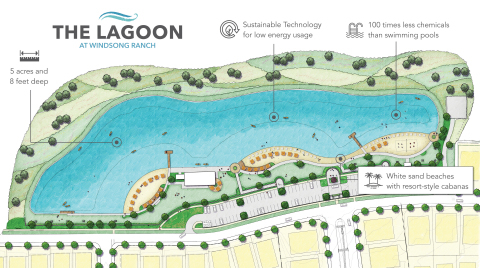 New five-acre, crystal clear lagoon to create beach lifestyle at Windsong Ranch residential master-planned community in Dallas, TX.